A theoretical overview and six case studies showing that the exile of intellectuals is a difficult, dependent, and fluid condition, whose achievements are dearly bought and whose endings rarely fulfill the missions informing their beginnings. Building on many years of inquiry into the sociology of intellectuals, notably through a series of books on the sociologist, Karl Mannheim, this book brings together the results of ten years of work on the special problems of intellectuals in exile. 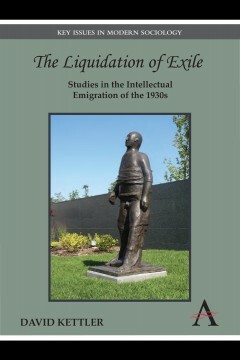 The historical materials all relate to the emigration from Nazi Germany, not only because this event has generated the richest literature in exile studies, but also because of the author’s personal connections to the situation and to a number of outstanding representatives of that exile. Case studies are devoted to the following figures: Johannes Becher, Ernst Fraenkel, Hans Gerth, Oskar Maria Graf, Kurt Hiller, Erich Kahler, Alfred Kantoriowics, Hermann Kesten, Siegfried Kracauer, Karl Mannheim, Hans Mayer, Franz Neumann, Nina Rubinstein, Oskar Seidlin and Carl Zuckmayer. The book opens with a systematic proposal for the study of intellectual exile, entailing a critique of approaches that neglect concrete political dimensions in favor of a metaphorical cultural approach. In the distinctive approach elaborated through a series of problem-centered case studies, the focus is on the multiple, complex and changing negotiating processes and bargaining structures constitutive of exile, especially as the question of return interplays with the politics of memory. The first three chapters deal with émigré intellectuals whose writings contain theoretically important reflections on exile and related conditions. The interplay and conflicts between the priorities of ambitious American university scholarship and the self-understanding of the exile cohort identified with the Humanities is the theme of the next detailed study. In the following long chapter, the focus is on the outcome of exile, documented by the first letters written by intellectual and literary exiles to individuals who had remained in Germany and with whom they had unfinished business. These diverse reopenings of negotiations are uniquely revealing about different ways of settling with the experiences of exclusion and the prospects of return. The final section of the book reverts to its very beginnings in two senses: it offers a self-reflection by the author about his own relations to the exile under study as a member of the “second wave” generation that arrived from Germany as children, with special attention to the elective affinities between himself and members of the actual primary cohort. David Kettler was born in Leipzig, Germany in 1930, and moved to the USA in 1940 as a member of the “second wave” generation of refugees from Nazi Germany. His publications extend across the fields of political theory, law and society, sociology, cultural studies and intellectual history. He is Research Professor in Social Studies at Bard College in New York, as well as Professor Emeritus in Political Studies and Cultural Studies at Trent University in Ontario.